Just imagine having these delicious Galettes Bretonnes in your cookie jar! They are really scrumptious and so easy to make. All you need are very basic ingredients with a few currants and there you have it - little French cookies for everyone! The French housewife is very good at making something so delicious from basic ingredients and this is no exception. She knows only too well how to feed her family well and will have the basic ingredients ready to turn out the most wonderful food stuffs at any time of the week. Why not try these for your cookie jar - they are very quick to make, very easy to do and are so delicious you will have to be careful how many you eat! You can use a processor if you want to mix the ingredients but here are the instructions for making the dough by hand. • Sieve the flour into a large bowl and rub the butter into the flour until it resembles fine breadcrumbs. • Add the sugar, salt, cinnamon and currants or raisins. • Add the egg and mix into the dough until it is smooth. • Place the dough in the refrigerator for about 1 hour to rest. • Roll out the dough on a lightly floured board until it is about 1/8 inch thick. • Take small pieces of dough and form into a small ball (about the size of an egg) and then flatten slightly with your hand. • Brush lightly with a little milk or egg. 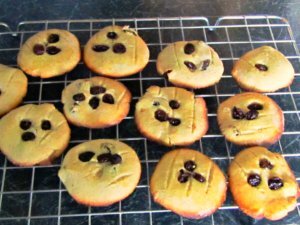 • Score the tops with a knife or a fork and sprinkle a few currants on the centre of each biscuit. • Bake in a hot oven for about 8 minutes or until they are golden brown. When you are ready to eat your Galettes Bretonnes I can say that they are truly wonderful with a morning cup of coffee and just as good with a glass of sweet white wine! So do enjoy them and share them with your family and friends!